Our extensive range of equipment for hire includes, shower stools, shower chairs, bath benches, over toilet aids, bed side and mobile commodes, lift and recline chairs, height adjustable chairs,wheelchairs,crutches, walking frames, wheeled walkers, hospital beds, bed sticks, bed rails, over bed tables, air mattresses, patient hoists, mobility scooters and power wheelchairs. You can hire by the week or the month or if you are an in patient of any of the Sunshine Coast Hospitals you may be eligable for a further discounted hire rate, ask your Physio or OT for details. If you are holidaying on the Sunshine Coast or have guests arriving we can assist with short term hiring of anything from a shower stool to an electric bed. 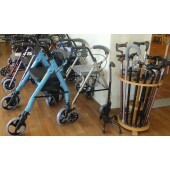 We are the leading supplier of mobility equipment to hire with all the Sunshine Coast hotels and holiday apartments. Please phone Buderim 07 5445 6787 or Caloundra 07 5438 2944 for prices and bookings ..